NOTE: This page takes a while to load since there are so many videos. Wait for it. I hope this will work. Here are all of videos in sequence order that I had made of the SR Johnson pearl handle fighter. Approx 11 hours of videos. I found two more tapes that may have more on them. I'm pretty sure I had recordered some of the gold inlay process but they aren't in any of these. I hope it is on one of the extra found tapes. My video8 player died though and I'll need to find another to see what is on the other tapes. Here is a completed picture of the project. These are the videos that go with the Cut a practice plate together online thread. Engraving is with the PalmControl. Hi Steve, it is very interresting, do you have the video when you make the gold inlay? This is just what us newbies need. I know I will spend a lot of time reviewing the videos time an again, until it soaks in, as will others I am sure. This is great stuff. Thanks a million for all the work you do. The only thing is; I can't hear it. I've got the volume cranked up to maximum and can barely make out a word. Is this just my computer or has anyone else had it happen? I haven't checked this set (can't see them through the Firewall Of Idiocy at work) but if you're hearing the graver purr then the volume's probably ok.
From what I've seen Steve doesn't talk to himself that much when he engraves. Roland, I found two more tapes that may have more of the knife engraving on them. I'm pretty sure I had recordered some of the gold inlay process but they aren't in any of the above videos. I hope it is on one of the extra found tapes. My video8 player died though and I'll need to find another to see what is on the other tapes. Greyback, In a few of what I labeled "initial outline cutting" I spoke a little. See if you can use that to adjust the volume. Also where I was using the rotary tool in the background removing videos.. see if you can hear and adjust the volume there. My older desktop computer doesn't put the sound volume out as well as my laptop. I can hear the finer shading videos better with the laptop. This could be the best organized show and tell engraving video reference on the internet! Thank you for taking the time to post it in such a convenient manner. Of course the project design and execution are exquisite! Thanks Rod, I hope it does help. There are more videos I've been meaning to upload too. One is of Gene Clark's watches. Now that there is a way to organize them it should make it easier. Here I am in Cottonwood AZ, taking classes (Engraving - 2nd Semester- Ms. Rachel Wells) at CETEC - Yavapai College, Prescot Valley AZ. This is a long drive for me - three time per week and trying to hold a job. If I may say - I find the forum / cafe fantastic. In the last few days I have learned more thru this site the I have for a while. During the time that I am in it, I will try to participate as much as possible. Glad to see you decided to enjoying this great forum and all the great information it has. Don't forget to let your classmates know of this forum and let them know they are also welcome to join. I just finished viewing the, Initial cutting of the SRJ knife videos. It is so great to be able listen to your thoughts and comments as you are cutting. This another complete and helpful diminution. I am a new Engraver. I am 67 and have been in the hospital 4 times since halloween. Ha Might be the shortest engraver in history. Ha. Anyway I am much closer to buying a Push Engraver from Steve. I know it has to be the best Engraving invention of the era and Steves Website, schools, His Help sites He is giving to Us for free who are not artists but merely mechanics deserves to be the Humanitarian award of the century to us. Thank You Steve for all of the help you have given to Me and many others just like me who thought you had to be an artist to do great engraving. What a wonderful tutorial! Thank you so much for sharing your beautiful work and guiding in my "learning" process. You are truely a Master and an inspiration. I'm curious about how the gold inlay is done. I have done silver inlay one time on a spider front site on a flintlock shotgun. This was done by undercutting the edges of the inlet and hammering the slightly thicker silver site into the inlet, locking it in. 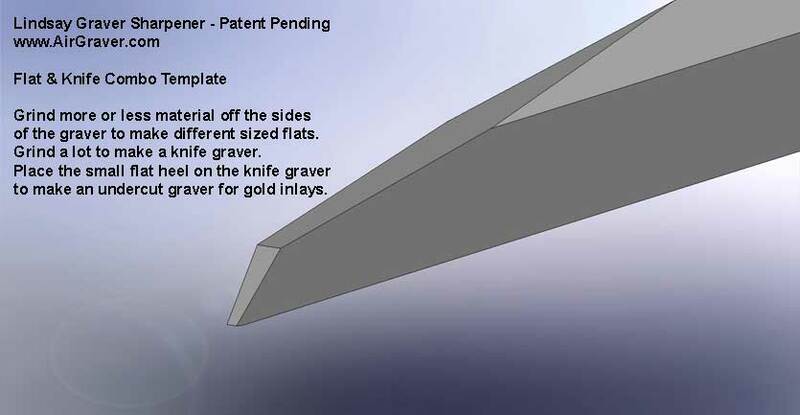 I'm wondering how your method differs, since it would seem that recutting the design as you do, following the seam of the two metals would destroy the joint and release the inlay, if done by the method I used. I'd love to see the video of the inlay process, if you find it. Thank you for the nice comments everyone on the videos. There are still those watch video's that I've been meaning to upload and add to these. Hi Jeff, The gold inlay pockets are cut away using the airdrill similar to the way I am cutting background out in these videos. After the pocket is made I undercut with a reshaped dental bur. It is like the smaller one I use in the videos but ground slightly smaller. I have described the process in the "cut a practice plate together" thread. Another way to undercut is how Raland Baptiste does it. We made a template for his undercut chisel. Still another way that can work for small inlay lines that are tough to get in to undercut is to use the same point in the above picture and jab in hooks at the bottom of the line. Be careful the hooks don't raise above the surface or you'll see white dots in the gold line after sanding flush. Thanks for the very detailed reply. The key bit of info that had me puzzled was solved by your diagram showing the thickness of the gold, and that it is anchored below the depth of the engraving cuts. I think this is unquestionably the best resource on the web for seeing and learning engraving. I hope you leave this prominently available for a long time as it continues to illuminate. The videos are very interesting.A lot of work for you but a delight for me hence, thanks a lot. I would like to know which gravers did you use for initial cutting and recutting? Hi Mohd, I used a universal template width graver (116 degrees) for initial cutting, recutting and shading too. Darn, I was hoping for happy little trees, bubbling brooks, and maybe an afro haircut (Bob Ross was my childhood hero, along with the guy in the cape on my underpants, hehe). Thanks Steve, This is what a beginner needs, like Carl said we will watch them over and over again. What I noticed and what's wondering me, I don't see you re-grip your vise with making a long spiral engravingline. It go's smooth in one move, what's your secret about that. I don't know if it's how Steve does it, but I took a class from Lee Griffithsand he'll start with his fingertips on the ball and end up with it in the crook of his elbow - maybe higher. He starts off turning it normally but if he runs out of 'hand' he just lets go and uses his forearm to keep it turning. Hi Willem, Sorry, I missed your question. Past the range of motion with my writst I walk my fingers on the vise to keep going round and round. i have been watching your 11-hr vids there great. do u have any vids or info on how to apply the gold? and do u have info on teaching the bulino engraving method that u did on that shotgun on your guns page? thanks tsp. Hi, all. John Murray here. Currently living just outside of Milton, DE and am gathering as much info as I can from this excellent site so I can try my hand at a little bit of scratching. I have been doing etching on copper for a long time, and mezzotint as well. (Thats where my login name for this site comes from.) Had the pleasure of meeting Ken Hurst a few years back in Kitty Hawk, NC and remain impressed with his exceptional skill and remarkable kindness. So, now I want to try engraving on a simple, manual push level. Just about ready to order a push handle and some steel and unique sharpening guide with stone. Honored to be here among so many talented and gifted folks. I'm going to continue reading and watching these infromative videos tonight and until my order gets here. I need all the help I can get, and am really grateful for any and all suggestions. I'm interested in how you did the signing. What tool did you use, & what is the height of the letters? I tried searching, but couldn't find the answer. Added after more searching: I found it. I don't know how to refer to the actual post/thread, but here's the answer. "For signing, sometimes I'll cut the letters and other times like in this case since it was a small border to sign on I'll just poke dots with a scribe. The scribe is made from a 1/16" rotary carbide bur sharpened into a point and held in a pin vise. In the video, I am first laying out the letters by lightly scratching them on and then I go back over it and place dots. There is a picture of of the carbide scribe over in the recent bulino thread but it is in a brass tube in the picture." Last edited by bildio; 12-26-2010 at 01:13 PM. Reason: Found answer by more searching. This my first post on this site. we need more teaching videos on here. Maybe some about lay or gun prep and engraving. When doing these videos which Template(s) did you use for the graver? And which is the best Template to begin learning with? Hi Donny, Used the clear 116 degree Universal template. Here is another tutorial with the basic cuts. Once you have those down, then it is just a matter of using combinations of these cuts to make the various leaves. Thank you. Gonna rain here this weekend so I have ME TIME to practice!! Just found and am browsing your site. Did you ever find the inlaying videos? I'd be interested in seeing the technique you use. I'm only a newbie, but it's on my list of things to try. For the larger areas that were gold inlay, are they only held in place by undercutting the edges, or do you crosshatch the inlay underlayment with a raised burr to help hold the gold, which is what I believe Meeks suggests? Your videos are a great example of the process, and like everyone else here, I'd like to thank you for putting them up. Is there a picture somewhere of your overall engraving workspace? Looks like you work under a 'scope a lot. Or is that just when you're making the videos? Very well laid out thread and videos, some late night viewing in my Tabletpc..
Just found and am browsing your site. Did you ever find the inlaying videos? No, I didn't. They were recordered on a video tape camera which was the same one we used for making home videos of the kids. Back then I believe I accidentally taped over that gold inlay tape I had recorded earlier. 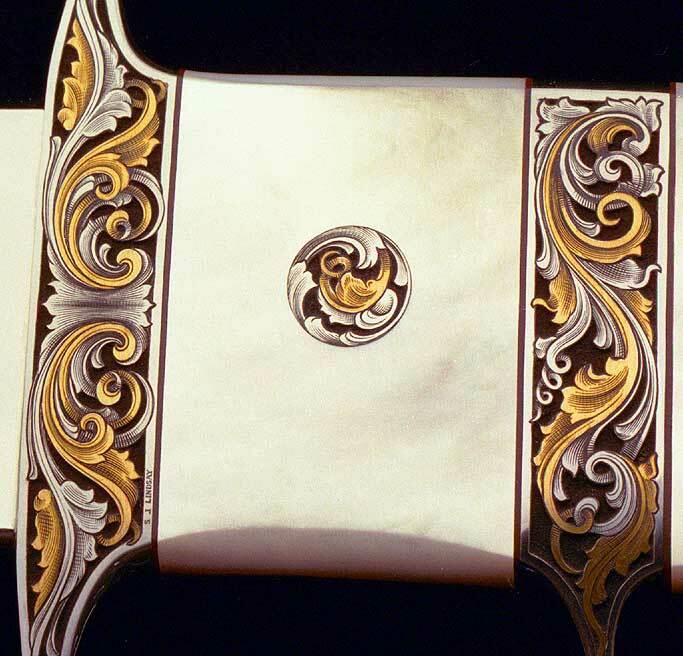 For the larger areas that were gold inlay, are they only held in place by undercutting the edges, or do you crosshatch the inlay underlayment with a raised burr to help hold the gold, which is what I believe Meeks suggests? I recess the area out with the nsk and also use that with a narrowed bur to undercut wotj. Out in the middle of larger sheet inlays I sometimes raised a few teeth to help make sure the center doesn't bow up. Here is a quick sketch of the inlay process. Your videos are a great example of the process, and like everyone else here, I'd like to thank you for putting them up. Is there a picture somewhere of your overall engraving workspace? Thank you Jim. Here is a picture of the engraving area in the new shop. Looks like you work under a 'scope a lot. Or is that just when you're making the videos? Yes, I pretty much always have engraved under the scope. Yo Steve, what kind of engraving room is that? No clutter? No piles of books and pictures? And a couch??? 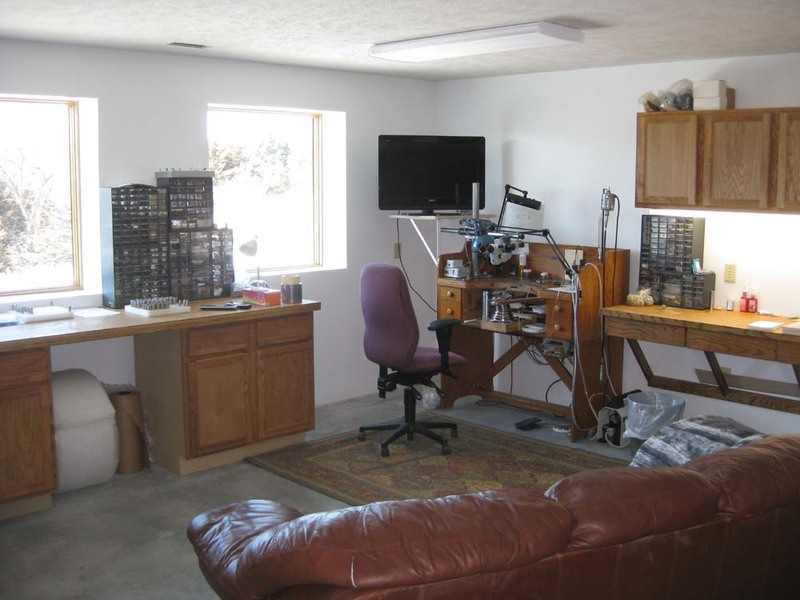 That is a Masters work bench with a rug ,you wont find any clutter or metal filings on the floor. Is this on a sticky post? Actually, it should be in every library in the civilized world. I will second that anytime anywhere Jim. Thanks guys.. Glad these videos are being helpful. I'll remember when I eagerly absorbed all the information. Thanks Steve.